Windows 95 and later versions (Windows 98, Windows ME) and Windows NT 4 and family (Windows 2000 and Windows XP) offers a user interface with several improvements over Windows 3.1-- long file names, icons on the Desktop, a Start Menu with multiple levels of nesting, and a Taskbar showing running applications are just some of them. Unfortunately, users too often find that after installing more than a bare minimum of programs, the Desktop, Start Menu, Toolbar, and System Tray become overly cluttered--making it difficult for users, whether students or teachers, to easily find what they need to simply start their desired programs. Luckily, we can clean up the Desktop and Start Menu, giving Windows 9x a cleaner interface that is both more attractive and much easier to use. Too many of us have Desktops cluttered with many icons--some of them leftovers of the Windows 9x installation, but not really needed, and others icons created by program installations. Ask yourself whether users need access to each icon--if not, maybe it should be deleted. You may want to create folders on the Desktop, and store some of your icons there. Or are the icons better off in an easily accessible place in the Start Menu or down as mini-icons in the Taskbar's Toolbar area, rather then on the Desktop at all? Personally, I prefer a cleaner Start Menu, since it’s always accessible, while program windows often cover up icons on the Desktop. The computers that I’m in charge of have just a few icons on screen--My Computer, Network Neighborhood, Recycle Bin, NetVista, and a customized Shutdown Windows icon. It’s easy to delete many of the extra junk--for instance, the Setup the Microsoft Network , and Online Services Folder icons are easily deleted. Check your icons-- if they have a little arrow in the lower left corner, they're shortcuts. Delete them freely; the original file they point to will still remain. If you have bunches of shortcuts for programs and files that you rarely use to start those programs, be brave... just get rid of them!. 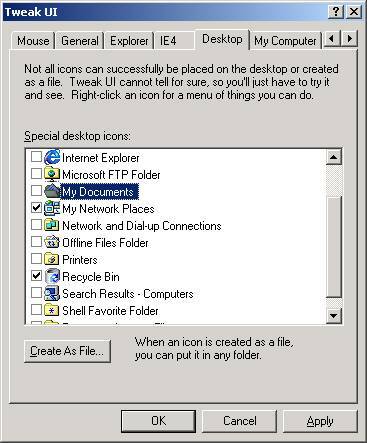 However, there may be problems trying to remove several of the other icons added by the Windows 9x setup-- In Windows 98, right-mouse clicking on them, and choosing Delete from the popup context menu can remove several of these. In Windows 95, however, this is not an option.. The easiest way to remove seemingly unremovable Desktop icons is with Microsoft’s free TweakUI Control Panel add-in. There are several versions of this. The original version (which works with versions of Windows up to WinXP) can be downloaded from Microsoft at: http://www.microsoft.com/windows95/downloads/contents/wutoys/w95pwrtoysset/default.asp?site=95 . Users of the original version of Win98 users will find a newer version already on the Win98 CD, in the \tools\reskit\powertoy folder. (Note that the Win98 version will also work with Win95 if you have Internet Explorer 4.0 or later installed). A so-called Win2000 version (aka TweakUI 1.33), which works with Win95 (with IE 4 or later), and all other Windows versions up to (but not including) WinXP can be downloaded at: http://www.microsoft.com/ntworkstation/downloads/PowerToys/Networking/NTTweakUI.asp . With all of these versions, locate the TweakUI.inf file, and right-click--choosing Install from the popup context menu. This will add TweakUI to the Control Panel--it can be opened from there. It includes multiple tabbed pages, with lots of handy options. (More on TweakUI in my tutorial at: http://www.zisman.ca/tweakui). Windows XP users need a totally different version, available from: http://www.microsoft.com/windowsxp/pro/downloads/powertoys.asp. Unlike the other versions, this installs as an application rather than a control panel icon, and includes enhances abilities. The Desktop page offers the ability to remove or restore most standard Desktop icons--simply remove the checkmark besides the icon, and click Apply or OK and the icon will disappear from the Desktop. Note: even TweakUI won’t let you remove the My Computer icon-- Microsoft, in their infinite wisdom and mercy, really wants you to keep that one around. You can, however, use TweakUI’s My Computer page to hide individual drive letters from My Computer- but before doing that, you should be aware that this also hides those drives from File/Open and File/Save dialogue boxes in your applications, and may have other unexpected consequences as well. A special Desktop icon to be aware of is My Briefcase. A number of users have been using it as their own spot for saving documents--sometimes with some peculiar results. My Briefcase wasn’t designed for this--it is a special folder with special properties. It was designed for users who are moving documents back and forth between computers, perhaps on a floppy from work to home and back again--My Briefcase is designed to help keep the various versions of the same document up to date. Unfortunately, it’s awkward and confusing to use-- my opinion is to simply delete it. If you really want a folder on the Desktop for storing documents, use My Documents or create your own. (If you delete My Briefcase and change your mind, get it back by right-clicking on the Desktop, and choosing New and then Briefcase). You may want to right-click on an empty spot on the Desktop--from the popup context menu, choose Arrange-- then chose By Name to line up the icons. Repeat, choosing Auto Arrange so that icons will automatically stay lined up. Windows XP has a nice option to automatically clean the desktop every 60 days, removing icons that haven't been used. To set this option, right-click the Desktop and choose Properties from the popup menu. Go to the Desktop tab, and click the Customize Desktop button. You can turn on or off the option to [ ] Run Desktop Cleaner every 60 Days, and can click to Clean Desktop Now. Whether done manually or with WinXP's Desktop Cleaner, you’ll have a cleaner Desktop, which you can decorate with a tasteful graphic of your choice. Let’s get control of the Start Menu. Typical messy Start Menus have too many icons in two places--the top of the Start Menu (above the Programs submenu), and within the Programs submenu itself. Both can (and should) be cleaned up. In order to get the Start Menu under control, it may be helpful to know how Win9x stores the Start Menu. Menu items are shortcut icons (like the Desktop icons), while sub-menus are folders within the main Start Menu folder. If you don’t have individual log-ins, then you just have a single Start Menu folder with C:\Windows--if you have individual log-ins, each user-name gets its own Start Menu folder, with their own set of shortcuts and folders. (And you may need to clean up the Start Menu and Desktop for each log-in individually). You can access these using My Computer or Explorer, and change the Start Menu by deleting, copying, or moving files and folders, just as with any other set of files. However, it can be a pain to wallow through the levels of folders to find where you’re going--and there are a number of ways to jump straight to editing the Start Menu. Here’s one way--right-click on an open piece of the Taskbar, and select Properties from the popup context menu. In the dialogue box that opens up, go to the Start Menu tab and click on the Advanced button. What you get is an Explorer-view of the Start Menu-- where again, you can create new folders, copy, delete, and move shortcut icons to your heart’s content. (Remember that shortcut icons are not the same as program icons--making 5 copies of a program’s icon would result in a lot of wasted hard drive space--five shortcut icons take virtually no space, but make it easy to start the program up from five different places-- so feel free to scatter shortcut icons generously). Depending on the software you’ve installed and your Win9x version, you could have a bunch of icons at the top of the Start Menu--above the Programs folder. New Office Document, WinZip, Windows Update Wizard, a folder full of assorted Corel WordPerfect icons (of which you use only one), and more-- things that probably don’t need to be in a such in-your-face location in the Start Menu. We’re not going to wholesale delete icons--you may find yourself wanting them someday, as unlikely as it may seem right now. Instead, we’ll move less used icons to lower levels, while making the most-used icons much more accessible. Start by creating a new folder--click on the File menu, then New, then Folder-- edit the folder’s name. At home, I call this one Check Here First!, while at Chief Maquinna Elementary School, I call it Maquinna-- no matter what the name, it becomes the only thing appearing at the top of the Start Menu--and it will contain copies of the most commonly-used shortcut icons. Drag everything else and drop them on top of the Programs folder, to move them out of the way for now. Take a peek at the Start Menu--you should see a (for now) empty menu on top, and everything else in a probably messy Programs sub-menu. If you’re like many users, when you click on Programs, you see multiple columns of folders, and a bunch of loose items at then end (or in Win98, you may have a single column with a little triangle at the bottom, to continue scrolling). If you double-click on the Programsfolder in our Explorer-view of the Start Menu, you see the same--but now you can do something about cleaning it up. To start with, make a number of new folders, named with categories of application-types. At Maquinna, the folders I add are:Applications(for various programs that get productive work done),Cd-Roms (for encyclopedias and other programs that need to have a CD inserted), Education(for all sorts of educational games and programs), Games, Internet (for Netvista, Netscape, Internet Explorer, and more), and Utilities(for all those things that are more tools than programs that you actually open on their own--virus programs, mouse, sound, and video utilities, movie viewers, etc). I also keep the existing Accessories folder for all those miscellaneous programs that come with Windows 9x--WordPad, Paint, and more, along with that Windows Update Wizard we may have moved from the top of the Start Menu. And don’t forget to leave the Startupfolder alone--Windows uses it to store icons for programs that start up automatically. (Left-mouse) drag nearly all the other folders and shortcuts within the Programs folder into one or the other of these folders--take a peek at your Start Menu--it’s more organized already! Now open each folder, and look at the contents--look for icons that you or your students use quite regularly--perhaps KidPix or Microsoft Works, or Windows Paint, or Netvista, or All the Right Type. Select the icon, and right-drag it to the left-hand side of the window, where you should be seeing a list of folders--including, at the top, the new folder you created for your frequently-used icons. Lift the right mouse button to drop it onto that folder--a context menu will pop up with choices: Move Here, Copy Here, Create Shortcut Here, orCancel. (Left)-click on Copy, to drop a copy of the icon here. Repeat for all frequently-used programs. (For a while, I made sub-folders of the Maquinna folder--one for each division, and gave each it’s own set of icons. (Remember, multiple icons doesn’t take much extra hard drive space). That way, each class knew where to look for its stuff--but it required an extra click to get anything started, and was a bit more awkward for the grade 1s and 2s-- this year, I’m using a single folder with everyone’s icons. Feel free to experiment). -Whenever you install new software, be prepared to do some menu cleanup afterwards-- too few programs allow you to choose where to put their icons--and even the ones that do don’t make it easy to place their icons in a folder buried inside another folder. -When you get one computer set up the way you want, you can copy the entire Start Menu structure onto a floppy disk (or a shared network drive), and copy it onto other machines-- as long as your programs are all installed into the same actual folders on each machine--if not, you’ll get icons that don’t know where to point--and Windows isn’t incredibly clever about finding the correct file if it’s in the wrong location. 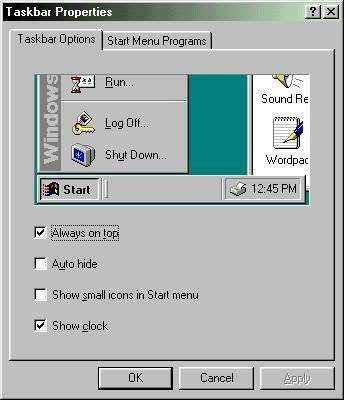 -Windows 95 automatically keeps its Start Menu items in alphabetical order. 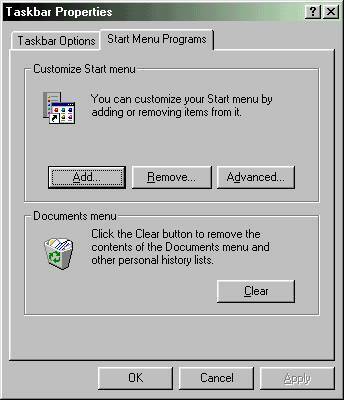 Windows 98 doesn’t--but if you open the Start Menu, and right-click on an out of order item, you’ll find Sort by Name in the popup context menu. Unfortunately, you’ll need to repeat for each out-of order submenu. -Similarly, Windows 95 Start Menus are relatively safer from students fingers than the Win98 equivalents--with Win98, you can right-click on an item right in the Start Menu, and choose (for example) Delete or Rename from the popup menu. Luckily, few students have figured out right-clicking-- and I don’t propose to teach them--do you? 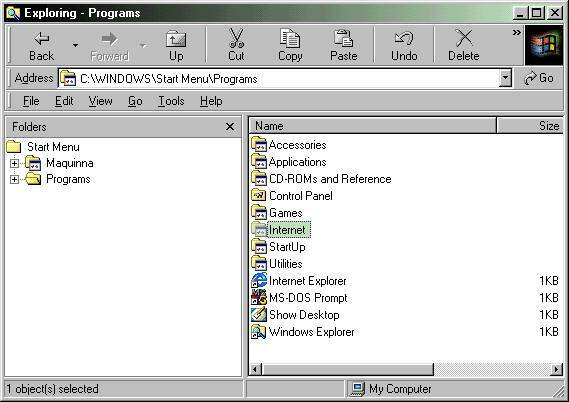 Starting with the Internet Explorer 4 add-on to Windows 95, and carrying through subsequent versions of Windows, Microsoft added Toolbars, optional sets of little icons either on the left-hand side of the Taskbar (beside the Start button), or on the right-hand side, beside the System Tray. The default set loaded is called the Quick Launch Toolbar. It includes an icon to Show Desktop-- in one step minimizing all open windows. (Click it again to restore the windows). Also included are icons for Internet Explorer, Outlook Express, etc. The QLT can be turned on or off, or other toolbars chosen by right-clicking on an unused piece of the Taskbar, and selecting Toolbars > from the popup menu. Personally, I find having half-a-dozen or so often-used program icons in this area useful. More icons than that becomes cluttered and hard to use. You can add shortcuts of your choice to the QLT by placing a shortcut on the Desktop, and dragging it to the QLT. Similarly, you can drag icons around the QLT to reorder them. You can remove icons by dragging them from the QLT to the Recycle Bin. For instance, the Show Desktop icon sounds handy, but have you ever used it? Similarly, several program installations add icons to the QLT, often without asking permission. If you don't open those programs that way (and when did you ever open the QuickTime Player from an icon anyway?) feel free to remove it-- you can always add it back later if you change your mind. In Windows XP, Microsoft doesn't display any Toolbars by default, but you can add the QLT if you like as described above. If you find it only shows a few icons, with more hidden behind a >> symbol, right-click an unused spot on the Taskbar, and uncheck the Lock the Taskbar item; this will let you drag the right-side of the QLT area to give it more display room. This is the area on the right-hand end of the Taskbar, with the clock and optionally other icons. Often quite a few icons end up there, making it difficult to use, and crowding out the space for running programs on the main area of the Taskbar. Some WordPerfect installations, for example, add icons for each of the many components of the suite. (One of the reasons to always pick the Custom installation option and pay attention to the choices). Unfortunately, unlike the Start Menu, Desktop, or Toolbar areas, Tray icons can be hard to get rid of. Many of these icons represent programs that are actually running, set to autoload at startup, and there are no standards for how to access them. Once again, take a look at the icons and ask yourself whether you can remember actually clicking on each to access its program. If you don't actually regularly use one of these icons, you may not want it taking up precious desktop space. Useful icons include the little speaker icon (for adjusting volume), a little monitor icon (for setting resolution and colour depth), and an icon for your anti-virus program. Most others are rarely used in my experience. Often mouse or video software adds an icon that duplicates settings available in the Control Panel-- but how often do you need to fiddle with these settings? Try clicking it once, double-clicking it, or right-clicking. Hopefully, one of these techniques will either open a program or pop up a menu. Look for an option to disable the icon. Simply closing the program may not be good enough-- it may come back the next time you restart. Windows 98, ME, and XP users may want to go to the handy MSCONFIG utility-- click Start, then Run, then type MSCONFIG and click OK. Go to the StartUp tab. This lists programs that run automatically at startup. Persistent Tray icons can be turned off from here, though it may take a bit of experimentation to find what to turn off. If you use a different Windows version that lacks MSCONFIG, download the free Startup Control Panel from http://www.mlin.net. Windows XP has a nice option that will automatically clean up the System Tray area, hiding icons that haven't been used often. You can set options for it by right-clicking an unused area of the Taskbar, and selecting Properties from the popup menu. At the bottom of the dialogue box, there's an option to [ ] Hide inactive icons. Clicking the Customize button lets you set options for individual icons-- opting to always show, never show, or hide when inactive. Right-click on the Start button. Choose Explore or Explore All Users from the popup menu. An Explorer window will open up with a tree diagram of folders on the left and the contents of a folder on the right. Notice the folder named Documents and Settings. Within this, are subfolders for each user, such as one named Alan Zisman. Note also the subfolder named All Users. Within each of these, are separate Desktop, Start Menu, Favorites, and other personalized folders. 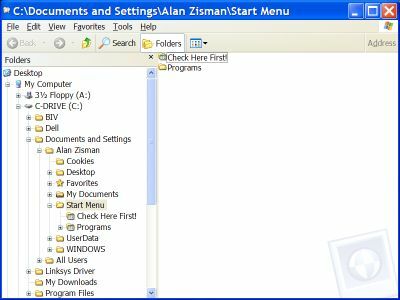 Items in the Alan Zisman desktop and start menu folders (etc) only show up when that user is logged in. Items in the All Users subfolders are always present, no matter who is logged in. Clean up both your personal Start Menu and Desktop items, and the All Users items. (It's probably a good idea not to mess with other users' desktop and start menus without involving them). Unfortunately, it's not always clear where icons will end up when you install software under NT, 2000, or XP. Some install programs let you choose subfolders-- and may list folder names twice if, for instance, there's a folder with the same name in both your Start Menu and the All User Start Menu. Other install routines will install in one place or the other without asking you or telling you which they are using. It's a bit of a pain to have to tidy up the Desktop, Start Menu, Toolbar, and System Tray. Especially since even after you clean them, they just start getting cluttered again. But then, it's like your physical desktop... or at least my physical desktop. Papers, envelopes, cables, piles of magazines, and the like have a tendancy to pile up wherever there's a flat surface. From time to time, I have to clean up. Why should our computers be any different?